Pamphlet Architecture 31: New Haiti Villages, the most recent volume since the publication's founding in 1977, seems to return to its origins. Both the first and the most recent are by Steven Holl, who started Pamphlet Architecture with William Stout, and each delves into a particular project by the architect, allowing some depth of exploration. 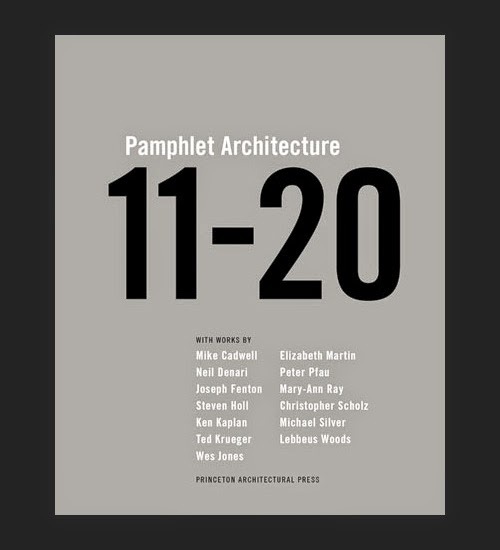 This is not to say that the publication has not changed or it does not represent change; if anything, the small size and relatively low cost (as well as Princeton Architectural Press's yearly competition and stipend these days) mean that Pamphlet Architecture is a good barometer for what is on the edge of architecture when it's released. For me, the most impressionable volumes came when I entered undergraduate architecture school in the early 1990s. Even though I could find early ones in the school's library, anything before #12 (Building Machines) just didn't interest my young mind. The text from that one may have been over my head at times, but the amazing drawings and models by Neil Denari and Holt Hinshaw Pfau Jones in Machines were something else. Though they were not as much machine as the devices envisaged by Ken Kaplan and Ted Krueger, who were part of #12 but were also the authors of #14 (Mosquitos). This "handbook for survival" has some amazing body/device imagery and stinging commentary; as Lebbeus Woods puts it regarding the latter, "Their use of the machine is both a critique of functionalism and a call for hands-on invention that transcends corporate goals and limits." Mr. Woods leverages his own critique at war and destruction in #15 (War and Architecture), patching sections of Sarajevo with dynamic constructions rendered in his signature style. These three volumes are a highlight of the Pamphlet Architecture series, and right now they exist in the middle of the series, a hinge of sorts between the earlier building studies and later explorations of cities, landscapes, and infrastructure. In addition to these, Steven Holl's Edge of a City (#13), Elizabeth Martin's Architecture as a Translation of Music (#16), and Mary-Ann Ray's Seven Partly Underground Rooms and Buildings for Water, Ice, and Midgets (#20) are also volumes that impacted me in school and later. That leaves #11 (Hybrid Buildings), #17 (Small Buildings), and #19 (Reading Drawing Building) -- #18 (A + A + ...) was never published -- three titles that I had yet to read. This collection allows for that to happen, but it also enables people who do not own or have not ready as many of the volumes to snag them for the equivalent of $5 each (or less online). Not bad.